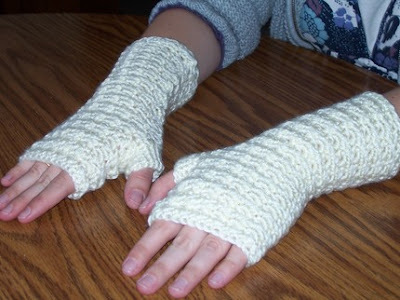 Created by Vanessa, a cozy Etsy shop, is giving away a pair of crocheted fingerless gloves/handwarmers. I love these because my hands (especially my "mouse hand") get so cold while I'm working. These allow you to continue typing while staying warm! Winner will receive a pair in the color and size of their choice. Simply visit Created by Vanessa and comment back here for a chance to win! *The winner will be announced April 7th. Good luck! Just found your blog from NaBloPoMo, and so excited to find a contest (not that I ever win). And those fingerless gloves just inspire warmth and cuteness, especially as I look out the window and see snow falling ... On April 1st?!? I love the plum wine ones. So pretty! Thank You for entering the Beso Hunter Boot contest. I hope you are given the opportunity to wear these stylish graphite hunter boots to reflect your love for the ocean. I want her green gloves. They are so nice! Maybe I'll buy them if I don't win. I like the white one in the photo to. I love these. She must be really good to sell them so affordable.I k.nit myself but don't think I could do these... I more of a washrag/hat kind of gal. I want the yellow gloves! They remind me of Spring which is my favorite season. I hope I win the white gloves! Her shop is pretty cool. I wish I could knit! I have seen her shop before!!! I almost bought a pair of gloves but was short on funds at the time. I would love to win a black pair. I like the chocolate ones. ((Size..I think I would need to measure). I'm guessing Large. I love the Vanilla and NAVY BLUE fingerless gloves! They look wonderful. I love the plum wine fingerless gloves. It's such a great color. AND...perfect for working on the comp when it's cold and my hands won't stay warm. No matter how much I turn up the heat, my hands are always cold. I like the black fingerless handwarmers in size small. Perfect for cold hands!